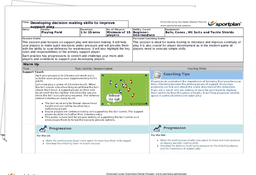 Rugby: Developing decision making skills to improve support play! Being able to support the play for the opportunity for an offload or to quickly get the ball out of the ruck is a great way to continue an attack and will not allow opposition defence to set. 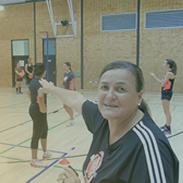 However to be able to offer the support, you need to develop your players decision making and ensure they know their roles and responsibilities. Continue the attack through good decision making. Warm up with a dynamic exercise, playing support touch to engage the players minds and bodies, ready for the session. In the technical part of the session, the practices work the players physically, ensuring they support the play when it breaks down, but also mentally. Encourage them to be reading the game so that they’re a few step ahead to be able to anticipate the following phase and to support accordingly. Finally, the modified game continues to test their support in a a game specific environment. Technique Focus - Improve decision making to be a step ahead of the play mentally, to offer the most effective support. Continue your attacks by staying a step ahead mentally.